There was some trepidation about the release of a new Gran Turismo game. 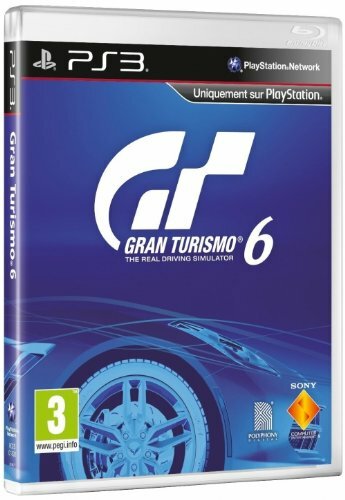 The fifth title in the series was, frankly, dull and that put a lot of pressure on Gran Turismo 6 to get it right and bring the series back to the must-have it once was. Not only that, but there was the question mark over whether GT6 would make it to the PlayStation 3 considering Sony had started its moving-on period with the announcement of the PlayStation 4. But we needn’t have worried. Not only is Gran Turismo 6 far from boring, it is a game of such graphical magnificence that it could be on the PS4 rather than its less powerful and older sibling. But PlayStation 3 owners can rejoice. Is this the best driving game we've seen in 2013? That’s the first thing that strikes you about GT6: it is quite simply stunning. At times the cars and surroundings look photo-realistic and while there’s an underlying feeling that things look a little too perfect to be real, it’s the first game that we don’t skip the post-race replays. Genuinely. Polyphony Digital, the developers behind the game, is a company that's a master at textures and polygons. Overall it has put together a package that is the best you are likely to see on the current generation of consoles. We don’t just mean in racing games, we’re talking across the whole gamut of genres. That’s not to say some corners haven’t been cut to ensure everything runs in 60 frames per second at a glorious 1080p. Occasionally you’ll see a dodgy, poorly rendered numberplate and there are some clever but noticeable texture drops on objects in the distance. But these are things you only notice if you are particularly looking for them. Hopefully you’ll be far too engaged in the racing to care. The gameplay part of the Gran Turismo 6 has barely changed in countless years, and rightly so. If you don’t like your racing games to feature realistic handling and artificially intelligent drivers that are more likely to stick to racing lines than not, we suggest you stop here and spark up Need for Speed: Rivals instead. But we’ve always been fans of games that fall more to the side of true simulation than madcap thrills. And, in that, GT6 is the newly-crowned king. The cars - and there are over 1,000 of them - handle differently from one another, and noticeably so. Based on their real-life counterparts, and more than with most games, you will find yourself memorising braking distances and speeds at which you can take each corner. Go too fast and you’ll inevitably end up in gravel - or worse. You can opt for driving assistance and the traditional arrowed markers that show both racing line and braking zones, but the challenge and therefore thrill is much greater once you feel capable enough to switch them off. The only issue we have with the driving part of GT6 is that, like with former iterations, the collision engine is next to useless. Even when you properly smack into the rear end of an opponent, you’ll feel like you hit a cardboard box - and might as well have, the affect it has on your car. And when viewing the replay afterwards, you’ll notice some minor body damage after the impact, but that’s all. Gran Turismo has always been about the beauty of motor vehicles, but to the extent that it protects them to the detriment of realism - a shame considering just how much effort is put into maintaining the simulation elsewhere. We do like the surround sound effects when your in-game car is hit though. If a racer bashes into you from behind, you will get the audio coming from that zone on your surround system. It helps remind where opponents are and you can counter them by track placement. A shunt won’t do much to you in racing terms - it will actually slow the opponent down a bit - but it’s nice to employ a sense other than sight for gameplay effect. In addition to the many cars, Polyphony has essentially created a love letter to some of the world’s greatest race tracks. There are plenty of them, including favourites Brands Hatch and Apricot Hill. But perhaps the greatest inclusion this time around is the Goodwood Hillclimb, the centre showpiece to the Goodwood Festival of Speed in the UK each year. We’ve not driven it for real ourselves - we’ve careened down the side of it at great speed on a golf buggy, but that’s a story for another time - so to get the chance to whizz up the track in some top cars in GT6 is highly satisfying. When it comes to the cars, too, there's more than one way to gain access: earn your way up the ranks through racing or part with real-world cash to buy in-game credits. It's never an essential to do so, but it's a shortcut if you want that top-spec Lambo. Some will find this frustrating that it even exists, we all but ignored its presence and got on with the game. Outside of the racing and sumptuous car and track graphics, the rest of the presentation of the game is reassuringly familiar to fans; perhaps cold and a little uninviting to others. In previous years, effort was made to make the user interface look a bit like a map of places to visit, but GT6 really dispenses with the niceties, opting for functionality instead. There are menus and icons and more menus and statistics and more menus and, you get the picture. To be honest, you’ll want to spend as little time here as possible and just get back to racing, and that might be the point. Sadly, the loading speeds will put a dampener on that plan. Although the gameplay visuals are next-gen worthy, you are given a stark reminder that this is a PlayStation 3 title when you’re faced with loading sections or races. More than a modicum of patience is required here. Admittedly, we haven’t tried to install the game to see if that helps and, surprisingly, the game doesn’t require an installation when it first starts - which is a mercy as we suspect it could be a long’un - but we think you’ll still be faced with moments where your anticipation wears off a touch during a spinning icon. Minor gripes aside, Gran Turismo 6 is considerably better than its most recent predecessor and one of the greatest driving games the PlayStation 3 has been treated to. Unlike previous iterations it's not intimidating to pick up and play and offers countless rewards for progression. Car collectors will love it for the sheer number on offer, albeit some are merely variations on others. Purist driving game players will absolutely adore the physics engine, while on-lookers will gape at the view along the way. If this is a swan song for current-generation gaming, it is one that asks a mighty question of the next-gen. Gran Turismo 6 is a technical tour de force that Polyphony and Sony can be very proud of. Very proud indeed.